Once again, Candy Experiments has received a personal invitation to the USA Science and Engineering Festival, which hopes to help get kids excited about science. You can't beat candy experiments for getting kids excited! At USASEF 2010 and 2012, we watched kids' eyes go wide as they weighed candy, and we cheered for them as they competed to sink marshmallows. We showed them how to make Warheads bubble. We helped them make chromatography rainbows, and taught one mother that the brown M&M's she chose for her children were full of the red dye she'd been trying to avoid! We love to see kids' eyes light up as they experiment: they're learning about reactions, nutrition, and math, but they're having too much fun to notice! Presenting at USASEF is our way of giving back to our country. We hope to help spark new interest in science, and to help fight obesity by showing what's really in our food. I can't count how many times our demonstration has made people swear off soda! We're making a difference--and you can help. 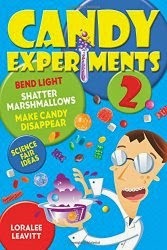 In return, contributors will receive various perks, including recognition on www.candyexperiments.com, candy experiment cards for Halloween, signed copies of Candy Experiments, thank-you postcards, candy experiment events, or space on the Candy Experiments banner at USASEF. Please help us take Candy Experiments to USASEF! Thanks for checking in, also for mentioning us on your blog. I'm actually looking for families to come volunteer if you're interested--the kids would definitely get to do some hands-on stuff that way! Anyway, stop by and say hello when you're at USASEF, I'd love to see you!